An ancient race. A floating city. An adventure more than 1,000 years in the making. 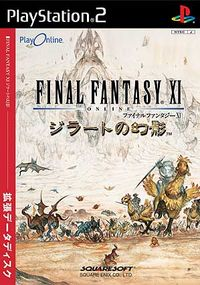 In April 2003, the story of Vana'diel continued with Rise of the Zilart, the first expansion of FFXI. In this expansion, adventurers set off to learn the truth of the Zilart -- a technologically advanced race that was thought to have died out years ago -- and to stop a mysterious enemy bent on destroying Vana'diel to enter the realm of the gods. The expansion first went online in Japan, and was available for North American PC users by October 2003 and for PS2 users by March 2004. Rise of the Zilart was available on PC in Europe by September 2004. This page last modified 2009-06-13 15:46:40.